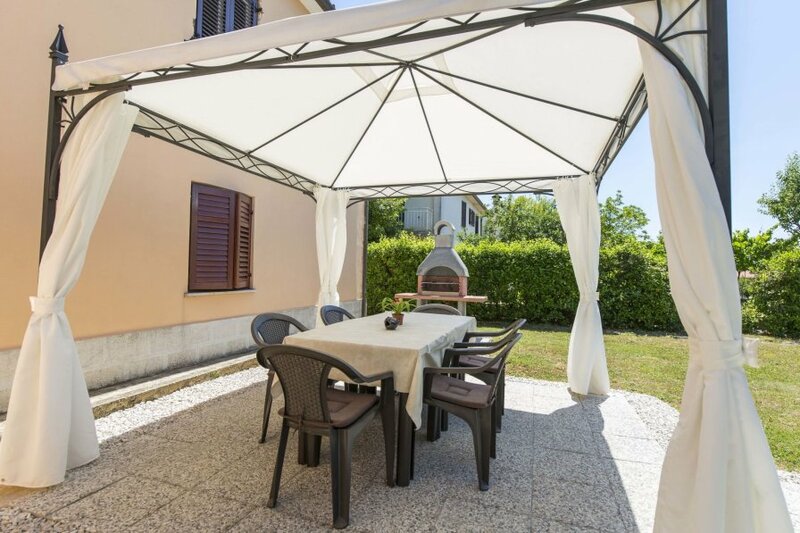 This 3-bedroom villa for up to 6 guests is located in Labin and has a private swimming pool. 2-family house Paola. 1.5 km from the centre of Labin, in a sunny position, 5 km from the sea. Private: property 250 m2, beautiful garden with lawn and trees, swimming pool (above ground) round (5 m2, depth 120 cm, 27.04.-28.09.). Arbour (9 m2), garden furniture, barbecue. In the house: internet access. Parking at the house on the premises. Supermarket 300 m, restaurant 50 m, pebble beach 5 km. Tennis 6 km, walking paths from the house 100 m, cycle lane 150 m. Available: garden with seasonal fruit (included in the price). 4-room apartment 85 m2, on the ground floor. Living room with 1 sofabed (90 cm, length 200 cm), satellite TV (flat screen), DVD and air conditioning. Exit to the terrace. 1 room with 2 beds (90 cm, length 200 cm). 1 room with 1 double bed (2 x 80 cm, length 200 cm). 1 room with 1 bed (90 cm, length 200 cm). Dining room. Exit to the terrace. Open kitchen (4 hot plates, oven, dishwasher, microwave, freezer, electric coffee machine). Bathroom, sep. WC. Terrace 12 m2, roofed. Terrace furniture, deck chairs. View of the garden. Facilities: washing machine. Internet (WiFi, free). 1 small pet/ dog allowed.